I just handed in Quintessence of Sand from Shogurei event and got character flag, Chieftan will not take my Yar'Lir Fang so I can finish tier 4? Any Suggestions Ive tried relogging doesnt help. Make sure that you went through all the text and received another character flag. Im missing either 4.0 or 4.1 or both but Chief respawns saying something about Shogurei so I assumed that I was missing Goblin Dojo (Mediation Stone) for progression but am not sure. Anyone have any idea his text he replies to me with isnt listed in overview? Chieftain Relae Aderi says 'You certainly appear eager and we do admire that so, but you are far to young to take on the difficult tasks I require." Out of curiosity what's your faction? I'm Amiable but thats not good enough apparently. Makes sense seeing as Amiable was required for Tier 2. You must need the next one up. Guess its time to do more Creators, heh. Can anyone tell me what the actual increase to your resists is? This is not true. Could this be updated as the factions TASKS (Tasks not in the camps) only give faction and some plat. NOT tokens, nor crystals! After turning in the wing fragments you must hail the captain to get the chieftan to accept the shadowscale. If you don't then he will just give the scale back. If you have logs and/or screenshots of this sequence, please send them to me at fleven@allakhazam.com. Just finished tier 5 and had to hail the captain before he accepted the Diseased Wing Frangment and the Shadowscale of Vish. Don't have logs but I can confirm it as well. In a world without walls and borders, who need windows and gates? Before a few hours i was kindly to keepers,between than and now i handed in 1 Token,this switched me to warmly.With this Faction i started a Minute ago Tier 5 and got offered without problems : Origins of the Curse and The Curse of Ju`rek but not In the Shadows (i guess In the Shadows will be opened after completing the first 2 missions or even with only the first - will post that soon)So it is not correct that you need ally faction or like on The Curse of Ju`rek Page stated high warmly.1 token hit into warmly is enough. Handed in 4 more Tokens now(i'm still warmly)and completed Origins of the Curse - (after that i still could not get "in the Shadows"),than i handed in the Diseased Wing Fragment and now they offer me "In the Shadows" too(i'm still only warmly - 5 Token hand in's into it).With the same Faction: i handed in the Vish scale and completed the DoN Progression with it.Got the 2 AA and the Sanctity of the Keepers AA. Simply handing in the items at the end of Tier 3 is insufficient? You have to hail him? If so, please let us know the dialogues. The Cleric Reward spell Blessed Touch has been changed to Ward of Retribution once it is scribed into your spell book. I found this out a few days ago when I was looking through my book for the Blessed Touch spell. The spell name has been changed to match the effect it suppose to do. So dont panic if you can not find the spell Blessed Touch, just look for Ward of Retribution instead. >>In order to begin more advanced tasks within the Norrath's Keepers camp, you must be of indifferent faction or higher. You can reach this faction by doing various solo or single group tasks. >>Wayfarers Mercenaries Bitral and Elanye (/loc +2240, -25, +70) give out solo tasks on behalf of the Norrath's Keepers while Kanetheus Forestwalker, Bianca Galbraith, and Boldger Bristlebeard offer single group tasks. I now read upon those single tasks from Bitral. (And yes, there are indeed 2 - the second one (lavaspinner silk) I am doing right now). But neither in the taskdescription from Alla, nor in my task window there is anything told about getting those crystals. So it seems to me, that this information is wrong. I guess the crystals are ONLY obtained through the tier1+ - tasks. I will keep an eye on that, as IF so, this whole DoN crytal thing would be crap to the skys!!! As you self say ... Tier 1 is only available for Lvl 65+. And If I only have the possibility to get crystals at this lvl, then WHO CARES upon buying with them spells almost 10 lvls lower?????? If anyone has further information upon that, I would be appreciated! AH! .. I knew there had to be something more ... so one can get crystals on 56+ ... That gives sense to the achievement of the spells available! Thx alot for the info! The tasks that Bitral gives you increase your faction with Norrath's Keepers. 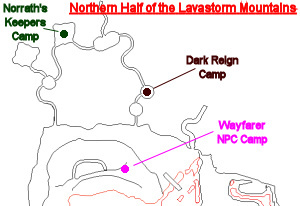 There are a number of missions that you can do for the Norrath's Keepers, but you MUST be indifferent to the members of the camp inside the cave. While the faction tasks that Bitral give you do not give you a token or radiants, they do raise your faction to indifferent so that you can draw your own missions. Those missions are open to levels 56+, and are different from the tasks given for the Tiered progression. Can the raid drops between evil and good raids be used interchangably for either side for progression? I have an item I looted on an evil side raid that they won't accept as a turn-in (just gives it back to me) even though I've done all turn ins up to that point and have my faction maxed. I successfully completed what I thought was the last part of the third Tier but when I handed in the Lava Spider Spinners and Warbeads, I got two character flags but no AAs and no indication of a bonus slot. Is there a way to check if I'm missing something and what it could be (just like PoP progression) and can I still get my Tier 3 stuff without going through the two raids at the end? I may be missing the group mission "History of the Isle" but it's been so long since I did this I honestly don't rememeber. I did the same thing. I never did the History of the Isle group mission after I completed the 3 tasks but went on to do the two raids. I turned in the Goblin War beads and the item from spider queen raid and got charactor flags. I just completed History of the Isle and got my buff slot and AAs. History of the Isle was so much easier than it sounded in the posts. We did it with 5 people with druid healing a rogue tank. I wish I had done it sooner - I would have got in on the drops from the two following raids. I completed the Tier 4 with Kindly faction, but it was very high kindly, one more dragon mission and it turned over to warmly. I was amiable and couldn't get the tasks for tier 3. I did a Creator mission. I was amiable and then could get the tasks for tier 3. The faction needed for tier 3 is, indeed, amiable, but somewhere in the middle. Just one task for solo? It would be darn friggin nice if they would at least include some solo progression content into these expansions. Heck look at LDon...try to get a group for that now, guess we wont be getting them spells now. "You devotion to Norrath's Keepers provides you with an innate chance to completely resist the effects of most detrimental spells. Required level equal to or greater than 68." Little reading goes a long way. You must have amiable faction standing or better to obtain Tier 3 tasks. As stated by another post, Tier 3 solo tasks are *not* obtainable with amiable faction as indicated above. Amiable worked for Tier 2, but not tier 3. I'm amiable and I got the tier 3 tasks so there’s no need for any correction. I am amiable too, but could not get the 3 tasks, so must be amiable OR HIGHER is correct. How far into amiable ...who knows? Combat Effect: Distracts your target for a moment, preventing them from taking any action for a short time. is this a root type or mez type of skill that rogues get? It is a 2-tick mez, resisted alot on high lvl mobs unfortunately. Kindly for 3, warmly for 4, ally for 5 honey. Actually, I just completed Tier 4 at kindly faction. I wasn't able to get the flags just after crossing into that faction level, but eventually I was able to get them & complete the tier BEFORE hitting warmly. So it's probably like the "high amiable" for Tier 3... I wonder if "high warmly" will work for Tier 5. Help keep Allakhazam useful -- rate posts. Does T4 have to be done in order? I was given Rune of Rikkukin as tier 2 spell reward. This is for enchanters, I guess every ones gets same spell?